Carmen Tafolla reads Estrellas of Possibility during the Inauguration. (March 21, 2018) -- UTSA President Taylor Eighmy received a very special gift this week. 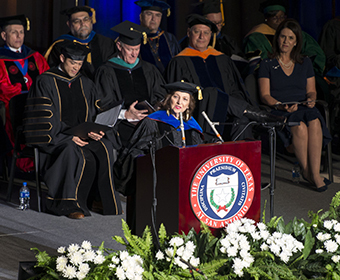 To commemorate his inauguration as the university’s sixth president, Carmen Tafolla, the 2015-2016 Texas Poet Laureate and a professor in the UTSA Department of Bicultural-Bilingual Studies, presented him with “Estrellas of Possibility”, the Inaugural Poem. Tafolla’s poem celebrates Eighmy’s vision to make UTSA a flourishing community that drives prosperity. the University of El Futuro. Tafolla adds President Eighmy’s interest in reaching both the English-speaking and the Spanish-speaking communities freed her to write the inaugural poem in her native code-switching Tex-Mex, to solidify his connection with both language communities. With UTSA advancing as San Antonio’s university of the future, Tafolla also wrote about the connection between the city and the stars. “The images of exploding stars, filled with energy and possibility drove me, and the distinct image of a billion drops of water bonded together and unstoppable touched both on his love of rivers, and of our city’s millennia-old heart, the San Antonio River,” said Tafolla. Learn more about UTSA’s vision for the future. Learn more about UTSA professor and poet Carmen Tafolla.